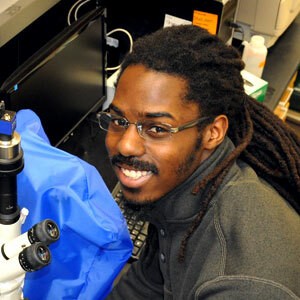 Doctoral student Joseph Taylor lights up when he talks about bugs. From his undergraduate work at Washington and Lee University in Virginia to his graduate work here at Washington State University, his research on insect predators has already resulted in some substantial success, including the recent award of a prestigious National Science Foundation Graduate Research Fellowship. Although he is passionate about insects now, Joseph’s journey initially started with excitement over a much larger predator. Joseph carried his interest in animals to Washington and Lee University—but he quickly became frustrated that most of the introductory-level biology courses were pre-med focused. It wasn’t until he took a course from his advisor, Dr. Lawrence Hurd, that he gained a fascination with insects. He realized that insects are diverse and numerous and their systems operate similar to most other animals. Joseph earned a Bachelor of Science degree in biology with a minor in Russian language and culture from Washington and Lee. While there he conducted three years of research, which resulted in two publications with a third well underway. His research was on the praying mantis, a feisty little predator with a triangular head that pivots like a cat. The upright position and folding forearms of the insect led to its nickname, which is a bit of a misnomer for a creature known to practice cannibalism and prey on animals larger than itself. Now a doctoral student in Dr. William Snyder’s lab here at Washington State University, Joseph is studying Carabid beetles, commonly known as ground beetles. A group of formidable and ravenous predators, the ground beetles’ role in agriculture is extremely beneficial, feeding on insects that can potentially destroy crops. However, ground beetles can be very indiscriminate, consuming smaller crop-friendly beetles. Joseph is looking for ways to help these insect predators do their jobs better in order to eventually move away from broad spectrum pesticides. His NSF grant proposal focused on this research. During his first semester at WSU last fall, Joseph talked with his advisor about writing a proposal for the NSF Graduate Research Fellowship—a program that supports outstanding graduate students who are pursuing graduate degrees in STEM fields. Joseph received significant guidance from his advisor on writing the proposal, and felt confident of its strength when he mailed it off. In March he was excited when he received notification of the fellowship award. In addition to the NSF Fellowship, Joseph was also awarded an ARCS (Achievement Rewards for College Scientists) scholarship. This scholarship, supported by the ARCS Seattle Chapter, supports the best and brightest doctoral students in STEM disciplines at both WSU and the UW. Washington State University has been a member of the ARCS Foundation since 2000 and currently helps fund 36 doctoral students. Students for this scholarship are nominated by their department. In 2015, the Graduate School invited Joseph to visit WSU on its Research Assistantship for Diverse Scholars (RADS) program, which is intended to increase graduate student diversity. The RADS awards are funded through a partnership of the Graduate School and the department/program of the prospective student. Hurd, Joseph’s advisor at Washington and Lee, had been Snyder’s undergraduate advisor and was familiar with his research in the Department of Entomology at WSU. He encouraged Joseph to consider a doctoral program here. After Joseph reached out to WSU and expressed an interest, he was invited for a RADS visit based upon his prior academic achievement. Although born in California, Joseph spent the majority of his life on the east coast. His mother was in the Army, which moved the family fairly regularly. He and his twin brother played football in high school and also for Washington and Lee University, where they both played safety. Because of his athletic background, Joseph enjoys being at a university and a community full of sports fans—but he also enjoys sitting in the stadium seats instead of playing on the field. “My body is much happier. It’s nice to see someone get tackled on the field and know it won’t be me hurting the next day,” he laughed. But to assuage his competitive drive and vigor, Joseph has taken up fencing, something he’s always been interested in. “It’s been a lot of fun and helps get rid of that excess energy,” he said. What started as a passion for dinosaurs has evolved into an exciting career in entomology for Joseph. Ultimately, his fully funded research may help create more efficient and less invasive solutions for farmers resulting in a healthier and more reliable food supply for the world. Joseph hopes to work for the USDA on pest management after earning his doctoral degree. Eventually, he would like to return to academia and continue to broaden his knowledge about the complex interactions between insect predators and their prey.